Contact relationship manager Swiftpage is migrating its Act! 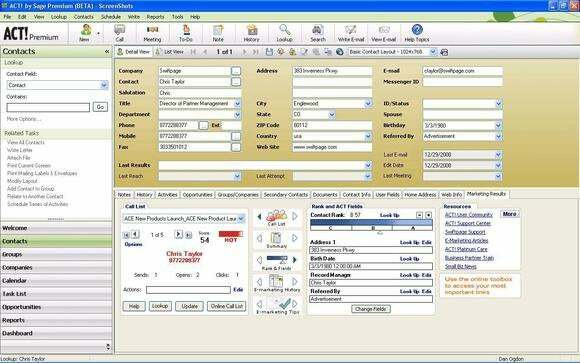 contact manager software to the cloud for smartphones and tablets and began inviting customers to try out the service on Monday. The new Act! Cloud is now live, and small-business customers can sign up and use the service for free during the open beta period, the company said. The beta will run until Act! Cloud's official launch, which will take place in "the next few months," according to a company spokesman. Last year, Swiftpage bought the Act! management software from its original developer Sage, and Swiftpage executives promised then to quickly increase the pace of updates to the software. The key, apparently, was an HTML5 client tucked inside of the Act! client, which forms the basis of the new service. An example of the Act! Cloud interface on a smartphone. Act’s purpose is to deliver “the most important information micro and small businesses need,” H. John Oechsle, the president and chief executive of Swiftpage, said in an interview. “The kind of demographics we’re serving are very interested in lightweight, fast-paced, device-independent” technology, and that’s what the cloud service represents, he said. Act! is designed to capture as much of each customer interaction as possible, building from basic contact information to family members, emails exchanged, and so on. Over time, Act! learns how each salesperson interacts with their clients, assigning a value that correlates to the interest level of each client. Act’s algorithms then go to work recommending which clients a salesperson should touch base with to maintain that relationship, Duet said. The Act! 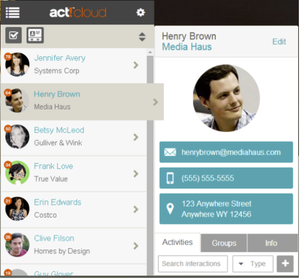 team has been building its latest iteration, the Act! Cloud, out over the course of several years, Duet said. When the beta expires, users will be charged about $10 per user per month to use the Act! Cloud, plus additional fees—perhaps $5 or so—for the ability to push additional email campaigns, Duet said. Swiftpage will also add a $20/user/month premium tier in the fall, he added, that adds additional services. One big one is the ability to record and/or transcribe phone calls between a salesperson and his or her clients, Duet said. Over time, Swiftpage hopes to add more and more services, increasing the value of the cloud subscription and increasing the accuracy of its predictions. “It’s all about capturing the interactions,” Oechsle said. Updated at 2:02 PM PDT with additional information.